At 11:25 AM on July 4, 1870, the Robt. E. Lee was making her approach in order to tie off at the St. Louis riverfront. It was the end of the Great Steamboat Race. The Robt. E. Lee would win the race with the Natchez from New Orleans to St. Louis in a miraculous time of three days, 18 hours, and 14 minutes. The Natchez arrived in St. Louis at 5:58 PM, six hours and 33 minutes behind the Lee. The race between the Robt. E. Lee and the Natchez could safely be said to be the country's first big media event. The telegraph carried updates on the race from the time they left New Orleans until the time of arrival in St. Louis. An estimated two million dollars had been wagered on the race between the two titans of nineteenth century river travel. At almost every point on the river, people could be seen waving and cheering for their favorite competitor. Farmers would bring their whole family to the river for the event. 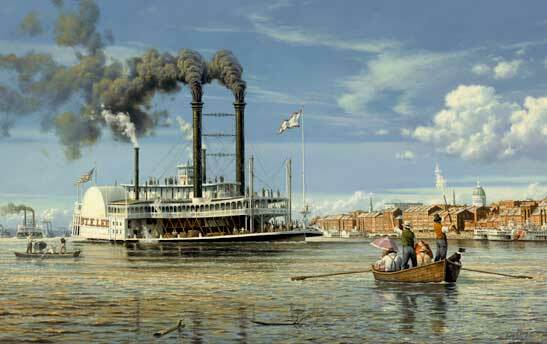 At Vicksburg an estimated crowd of 5,000 met the two steamboats, 20,000 at Memphis, and 8-10,000 at Cairo just to give some examples. In St. Louis, as you can see with close examination of the painting, thousands were also on hand for the historic event. If one were to study the importance of the river systems of North America from its earliest inhabitants thousands of years ago until 11:25 AM on July 4, 1870, we would be safe in coming to the conclusion that river travel reached its zenith on that fourth of July morning. There would never be an event on the river to rival this one; and the railroads had already begun to make us aware of their inevitable future dominance of the country's transportation needs. The Robt. 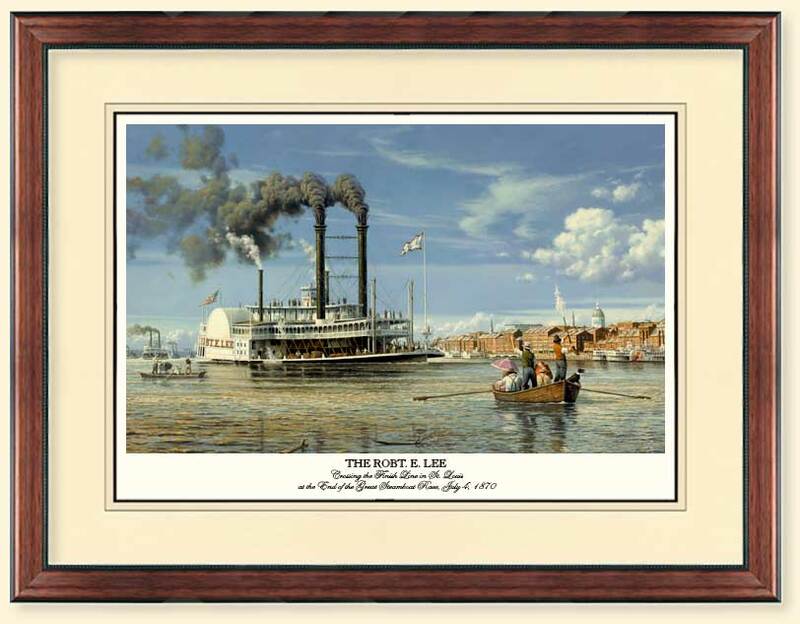 E. Lee was perhaps the most celebrated steamboat ever built.